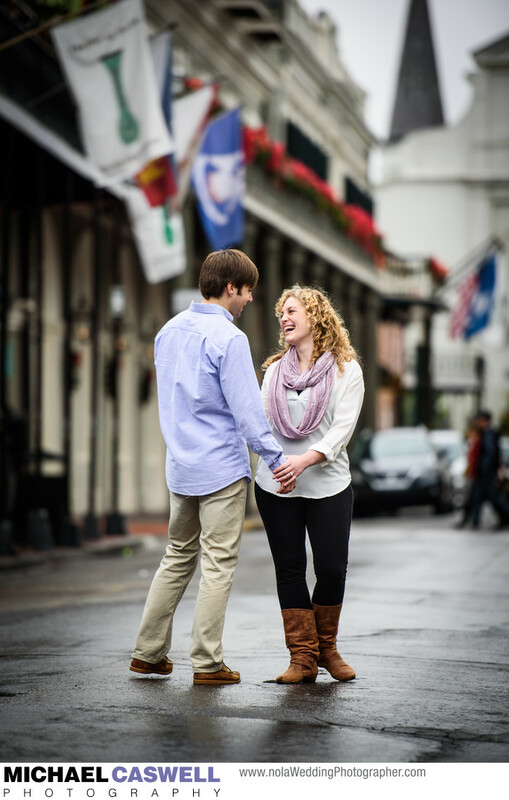 Though no couple wants bad weather on the day of their engagement portrait, one significant benefit to having some rain move through the area prior to the session is that it gives the streets of the French Quarter that nice, slick, partially reflective look that really enhances photographs. A light overcast sky also makes for better light to shoot with. In this shot of a New York couple who traveled down to New Orleans for their engagement portrait, I simply directed them to stand in the middle of the street and dance around and talk with each other for a few minutes, pretending like I wasn't even there. Though we occasionally had to pause and move out of the way for cars to pass, the result was a wonderful series of very natural looking images that capture their personalities much better than a simple posed look at the camera kind of photograph. On this particular street, which runs behind St. Louis Cathedral, the common shot is straight down the middle of the street with the couple standing in front of the Cathedral centered in the background. Though I've done that shot many times before as well, for this image I thought that the shooting at an angle, with the façade of the Bourbon Orleans Hotel and flags captured softly out of focus in the background would be more visually interesting.